Hidden between the endless forests west of Kellefteå lies Abborrträsk, a tiny village that is surrounded by some of the best fishing holes in Europe. The lake area Tjärnheden around Abborrträsk is the place to be, whether you seek pike, perch, char, grayling or even salmon. It will sometimes take some effort to get to the best spots, but with the right guidance everyone can have the best day’s fishing of their lives here. Picture this: a lake that has a primeval atmosphere. Along the shorelines and into the water the lake is surrounded by fields of equisetum or horse tail. This plant is a living fossil and good news for fisherman who love to fish for pike and perch with shallow running or ‘topwater’ lures and flies. Predatory fish love to rest and hunt in the protection of the plants. 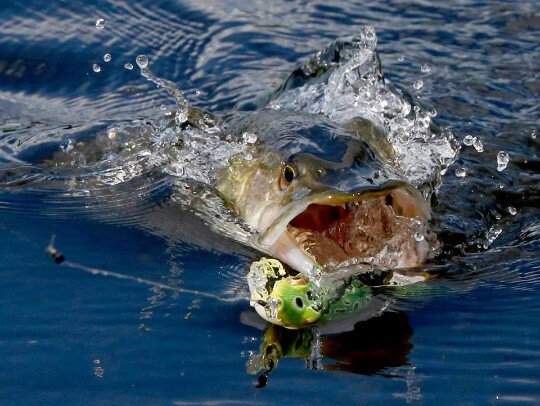 It may be the holy grail for many an experienced pike fisherman and –woman: topwater fishing for pike. Especially early in the season, predators are eager to visit shallow parts of the lake where they feast on fish, frogs and other small animals trying to cross the lake. The fishing can be heart-stopping, when a large pike smashes your lure and you get to watch every move. Some of the many lakes around Abborrträsk are among the very best in the world for this type of fishing. Early June with the ice just melted, fishing can be extremely good and days of dozens of eager pike are more the rule than the exception. Back to our expedition. While I get my breath after some serious boat dragging, my fishing buddy has taken his fly rod and throws a imitation frog right between the bank vegetation. It takes five seconds for a small pike to find the fly and hook itself. The boat is not even in the water and the first fish is landed. It will be one of many. Pike up to a metre attack our flies and lures with spectacular moves. Once hooked they put up a areal display. Regularly, we are both fighting fish at the same time. The action is fast and furious and when the fish seem to have left the shallows, we focus our attention to some of the deeper parts of the lake. With sinking lures and lines we rediscover the pike and find some good sized perch to well over a kilo, thrown into the mix. Pike might be the star on most lakes around Abborrträsk, they certainly aren’t the only fish that deserves a place under the spotlight. Sonny Holmberg of Abborrträsk Natursafari has another ace up his sleeve. Hidden in the forest are a couple of small lakes that are teeming with arctic char and grayling.. The char are the main attraction for tourists visiting Abborrträsk in winter time. With ice fishing equipment these brightly orange coloured fish are enticed. Some of them end up on the grill while Natursafari’s Sonny and Karin treat their guests on a memorable meal. In summer the lakes provide a different type of scenery. As the ice disappears, they become the ultimate playgrounds for serious fly fishers. Whether your fly of choice is a tiny dry, a nymph or even a deerhair mouse imitation, the chars are often willing to play. And they come in record breaking sizes. It could well be that you hook a fish of a lifetime in one of these little lakes. And even when the chars aren’t that eager, there is still plenty of action to be found for the fly fisher who perseveres. My worst day on one of the char lakes ended with one plump char. As they weren’t really playing I changed tactics and fished a small nymph around sunken tree stumps and other structure in the water. This change of plan resulted in fifteen grayling between 40 and 50 centimetres in length. Anywhere on the planet, this would have been a great day’s fishing. Over here the grayling were the consolation prize. Not for me though; I thoroughly enjoyed another day along one of the many lakes in the area. Although fishing was below expectations that day. The Abborrträsk experience was always there and didn’t disappoint. From the air Tjärnheden looks like a Swiss cheese made of forest and lakes. The number of waterholes is mind blowing. So even if fishing is tough, you know that there must always be another lake with fish willing to bite. Sonny knows these secret spots and always has some fishing holes as a backup when times are hard. I remember a trip early June. Nature was still coming to terms with a slowly rising temperature. The pike lakes were suffering. With a unseasonably low water temperature, the fish were eager to follow our lures but weren’t taking them. It became frustrating. “But not to worry”, Sonny told me. That evening I was led to a beautiful pearl in the forest. More a swamp than a lake and temporarily in use as nursery for crane chicks who greeted me with nervous squeals. It became a magical session. The shallow and thus slightly warmer lake was teeming with pike, eager to attack our topwater lures. For the first time in my life I witnessed two pikes colliding as they were both attacking my fly simultaneously. Between every patch of floating green, pike were hiding. At the end of the day we lost count of the pike we hooked and landed, with a metre-plus giant as the icing on the cake. There are still many waters that need to be discovered. There is always another lake and fortunately there is always another time to fish it. Abborrträsk is easily available by car, train or airplane. If you book a trip with Abborrträsk Natursafari, Sonny will pick you up from either train station (nearest is Arvidsjaur), or from the airport in Arvidsjaur or Skellefteå.